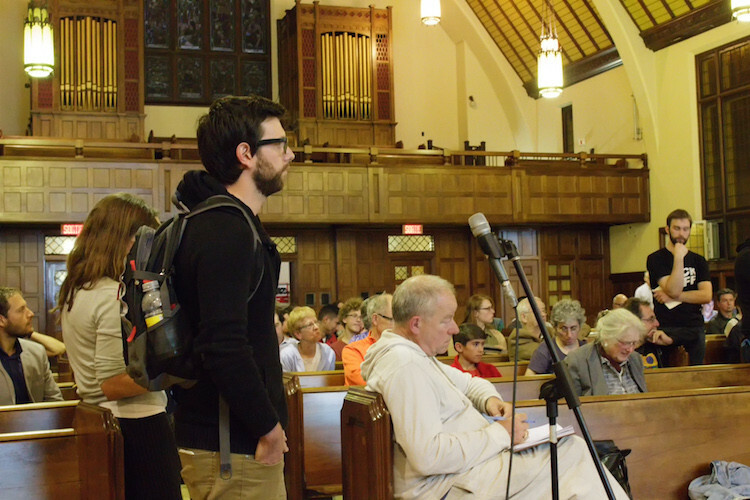 Around 200 concerned citizens and environmental activists packed into the Loyola Chapel on Thursday evening to listen—and be heard—on the topic of Canada’s climate change plan. The event was hosted by Marc Garneau—the federal minister of transport—as part of a series of public consultations on climate change, which the federal government says will help shape its policy on the matter. Audience members were invited to line up in front of microphones and share their concerns and suggestions on climate change policy, and the minister took several opportunities to directly answer the public’s comments. 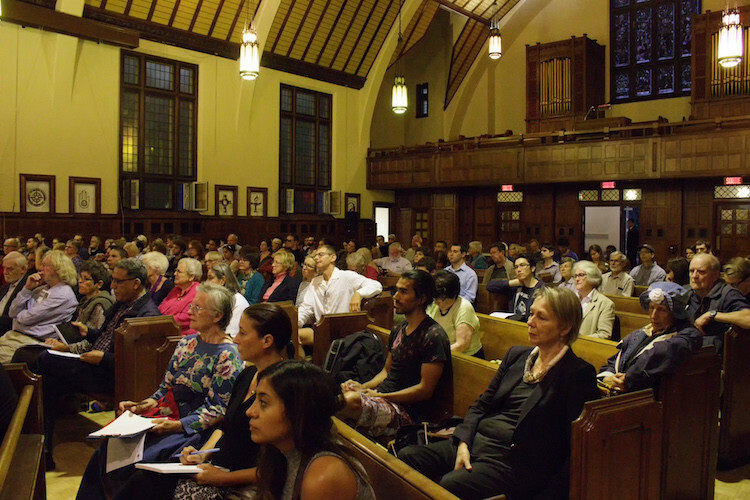 The event drew sometimes sharp criticism of the Trudeau government’s approach to the environment, while some audience members took the time to express their gratitude for the consultation. Several audience members voiced their support for a price on carbon as a positive step towards reducing greenhouse gas emissions, and while Minister Garneau said a carbon tax is a priority, he emphasized that each province would work out its own policies for dealing with climate change. Beyond the role of provinces, Minister Garneau also underscored the importance of individuals doing their part by making smarter decisions on things like transportation and diet. Alex Tyrrell, leader of the Green Party of Quebec, was in attendance and took Minister Garneau to task for these comments, saying that the federal government was trying to pass the buck on climate policy. “The fact that you’re talking about individual actions when you’re the minister of transport demonstrates this lack of leadership,” he continued. Several times over the course of the consultation, audience members brought up the proposed Energy East pipeline and the delayed National Energy Board review, saying that the federal government needs to step in and scrap the project. The minister responded by touting the importance of the NEB review, a process which he said was based on “independence” and “neutrality”. But Marcus Peters of the group Divest Concordia says that a consensus has already been reached that opposes the Energy East pipeline. Tyrrell agrees that enough information is available to make a decision on the Energy East pipeline, and he called on the federal government to intervene. Will Public Consultations Affect Policy? 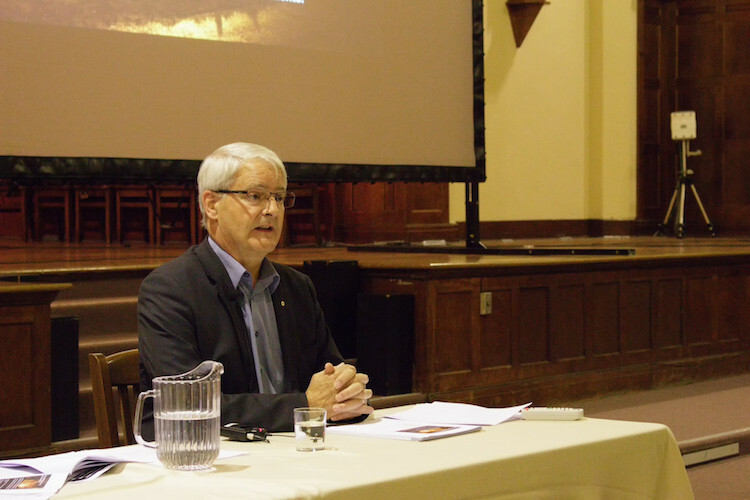 Throughout the evening, Minister Garneau said that public consultations are a key component to the government’s approach to addressing climate change, and that Canadians’ thoughts on the issue are being seriously considered. However, some attendees expressed skepticism about the impact that these consultations will have on federal policy. “[The Liberals] essentially have the dream position for a government in power: they have a majority government, they’ve had the longest honeymoon period in Canadian political history, and they’ve made these promises that are very achievable, [but] they’re still hesitating and looking for a more solid mandate from the public,” Peters of Divest Concordia explained. How Is Montreal Preparing for More Spring Floods?